The “Avios Redemption University” series is a good starting point for beginners, although I hope everyone will learn something from it. Click here to see the other “Avios Redemption University” articles. This article explains everything you need to know about booking Reward Flight Saver redemptions with Avios. 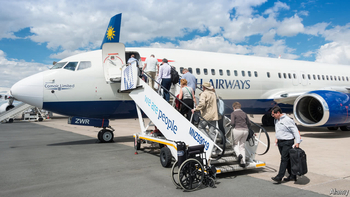 When British Airways created Avios in November 2011, the one change that came totally out of the blue – and in a very positive way – was the introduction of Reward Flight Saver. Reward Flight Saver allows anyone who has earned one Avios in the last year to book a short-haul Economy reward flight for £35 in taxes and charges, or £50 for Club Europe. Looking across all frequent flyer schemes EXCEPT Avios, short haul redemptions are a waste of time unless you need flexibility or are travelling at short notice. Lufthansa‘s Miles & More scheme is the perfect example of this – it is very easy to find M&M European awards where the taxes actually come to MORE than the price of buying a cash ticket! This is because Lufthansa artificially pushes down the taxes on cash tickets if a competitor on a route is charging less. Whilst British Airways had never got this bad, you were still looking at £100 of taxes for a short-haul flight to Europe before 2011. Added to the 9,000+ miles required, it made the redemption very, very bad value. With Reward Flight Saver, the dynamic changed completely. At 9,000 miles plus £35, a Reward Flight Saver redemption is one of the most valuable Avios redemptions you can get. A flight to Germany in economy will be at least £125 for prime weekend break timings, so you would be getting 1p per Avios. That is decent value to me. Should we be sceptical about the value of short haul redemptions? That said, short haul air fares in Europe are only heading one way – and that is down. The ‘elephant in the room’, which I never hear discussed by loyalty executives, is that your air miles are being constantly devalued by the fall in the cash alternative. The industry is always trying to think of ways of devaluing your points from their side, ignoring the fact that value is already being chipped away every time fares are reduced. I generally argue that, as long-haul business class seats get better and better, it offsets the regular devaluation in frequent flyer schemes. You certainly can’t say that short-haul seats and service are getting ‘better and better’, however. Here are the key points you need to know about Reward Flight Saver (‘RFS’). The official ba.com description of RFS can be found by scrolling down this ba.com page. Reward Flight Saver is not available on Flybe redemptions or any other BA or avios.com partner unless the partner is a BA franchise (eg SUN-AIR, Comair). You cannot, for example, get RFS pricing on Finnair‘s Manchester to Helsinki route. Note that the Flybe partnership is ending on 30th April 2019. Iberia does not have Reward Flight Saver so you need to pay standard taxes and charges on their flights from the UK to Spain, or elsewhere on the Iberia short haul network. You also cannot get Reward Flight Saver on BA’s sister airlines Aer Lingus, Vueling, LEVEL, Iberia Express or Air Nostrum. Whilst a lot of people don’t believe that Club Europe offers great value for cash, unless you are chasing BA tier points, I believe that Club Europe redemptions using Reward Flight Saver can be good value, especially if you have no status. This is especially true if you just upgrade the outbound leg, due to the decent BA lounges in Heathrow and Gatwick. Upgrading the outbound of a trip to Germany on an off-peak day would be just an extra 4,500 Avios one way plus £7.50. That’s a bargain in my book for access to the Heathrow or Gatwick lounges, fast track security, priority boarding, the empty middle seat and the Club Europe service, such as it is. Think twice about booking Club Europe from London City Airport. City Airport does not have a lounge and the Embraer aircraft used are 2 x 2 seating in both classes so there is no empty middle seat. Priority Boarding isn’t worth much either due to the high percentage of passengers at City who have British Airways status and can also board in the first group. Economy passengers from London City still get free snacks and drinks too. You must double this for return flights. Club Europe costs exactly double Avios on peak dates and slightly less than double, oddly, on off-peak dates. The 2019 calendar of peak and off-peak dates for British Airways can be found here. As long as you have earned one Avios during the previous 12 months, you will see Reward Flight Saver pricing automatically when you search for Avios seats on British Airways on ba.com or avios.com. Remember – you MUST have earned one Avios point during the last 12 months to see Reward Flight Saver pricing. I often receive emails from people who think RFS has been scrapped, often when using a family member account, because no activity has gone through it in the previous year. Few people realise that taxes are now lower, on many routes, if you book European redemptions as two one-way flights. You can save up to £15 per person. This is because, as British Airways has dropped fuel surcharges on European flights, the £17.50 one-way RFS fee can be higher than the actual taxes and charges cost on an inbound flight. I explain more about this odd feature in this article. A one way from Dublin in Euro Traveller, for example, has tax of only £11 – booking a trip to Ireland as 2 x one-ways will cost (£17.50 + £11) £28.50 in tax compared to £35 in tax if booking a return starting from London. This was the biggest hit from the April 2015 Avios changes to anyone who lives outside the South East. It used to cost the same 9,000 Avios + £35 to fly Manchester – London – Berlin as it cost to fly London – Berlin. This is no longer the case. The domestic leg is now charged at 9,000 Avios + £35 return on a peak day. The Manchester to Berlin example would now cost 18,000 Avios + £70 in economy. When you factor in the hassle required to change planes at Heathrow, it is very unlikely that you would want to do this. Comair has a decent network, flying in BA-branded aircraft, around Africa. This may come in handy if, for example, you need to get to Cape Town but can only get a redemption seat from London to Johannesburg. Comair also flies from Johannesburg to Mauritius. Comair has different charges for RFS redemptions which are substantially higher than BA’s at £80 return for Economy and £140 return for Business. Add in the number of Avios required and a cash ticket is likely to be better value. The London to Moscow route is the only sub-2000 mile route from London which uses long-haul aircraft – although not on all flights. This means that you can use Reward Flight Saver to experience the Club World flat bed seat or, depending on aircraft, even BA’s First Class service. However, remember that you need a visa to visit Moscow which can be expensive and time consuming to obtain. British Airways also runs a long-haul aircraft on one daily flight from Heathrow to Madrid, for cargo reasons. This is a great way to try a Club World flat bed for a couple of hours. A ‘Fifth Freedom’ flight is one where the plane stops en-route to its final destination to drop off passengers, and also takes on new passengers at the intermediate stop. British Airways uses these so called ‘Fifth Freedom’ rights to sell tickets on flights which neither begin nor end in the UK. Club World is 15,500 to 18,000 Avios + £50 return. Turks & Caicos is a longer flight and costs 25,500 – 30,000 Avios + £50 in Club World, return, depending on date. If you have never tried BA’s Club World or First Class service, then this is a cheap way to do so if you are in the region – and possible turn your holiday into a ‘two centre’ one at the same time. You can learn more about BA’s ‘Fifth Freedom’ routes in this HFP article. SUN-AIR runs a small network of flights from Scandinavia, flying BA-branded aircraft under a franchise agreement. From Manchester, it flies to Billund in Denmark. Billund is the home of Legoland! All routes are available as Reward Flight Saver for 9,000 Avios plus £35 in Economy on a peak date. You can also use Reward Flight Saver on non-UK Sun-Air routes, such as Munich to Billund. You can see the full SUN-AIR route map here. I hope this article clarified some of the common questions I often get about Reward Flight Saver. The official Reward Flight Saver page on ba.com is here if you want to find out more. If you got the letter closing your Lloyds Avios Rewards Amex card, what should you do? Is the Business Class availability on Iberia (to book via Avios) and BA linked? Currently can see 2 Business class on BA’s website and Iberia’s website as we need 4. However, wanted to check that if i book 2 via BA, will I not be able to book the ones via Iberia or do they have separate quota? Apologies for the off-topic comment but I wasn’t allowed to post under the 2-4-1 articles. I have booked a one-way reward flight out of London for me and my partner using avios+money. A few weeks after booking them I triggered the 2-4-1 voucher which I would like to use for the flight I have booked already. Is there a way of modifying my booking so that the 2-4-1 voucher is used? No more reward seats are available for this flight. No, can’t be done unfortunately. Thanks a lot for the prompt reply!